This is a cosy room that is perfect for smaller events. The surface area of the room is 67m2, and it can be rearranged in a theatre-, classroom- or lounge-style configuration, as necessary. The modular tables in the room facilitate holding meetings in a U- or O-style configuration or behind a long table. 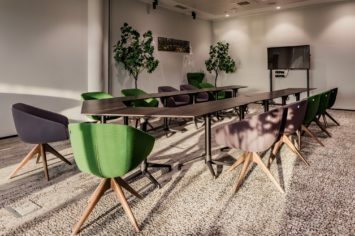 The room can be used for many different purposes – it is perfect for training sessions, meetings as well as different customer events and formal receptions. Both of the rooms have a flipboard, internet connection (Wi-Fi), a 55′ TV or a video projector with a screen. On the basis of the format of the event, you can also order catering services and coffee breaks – all of the necessary amenities are available. The rooms of the VIP complex can be easily accessed with a car as well as public transportation. There is a car lot for 30 cars available for an additional fee.